These are inspired by and adapted from a secret family recipe for cinnamon rolls that my aunt made for many years. Since I've been making these recipes I have adapted a good and easy to follow plan kinda like changing the batteries in your smoke detector at New Years. At Christmas time I replace my yeast, baking powder and baking soda supply so they are always fresh. •Heat it until is is just about to boil, but don't allow it to boil. Turn off the heat and let it cool until warm...but not too warm! refrigerate the dough until you're ready. 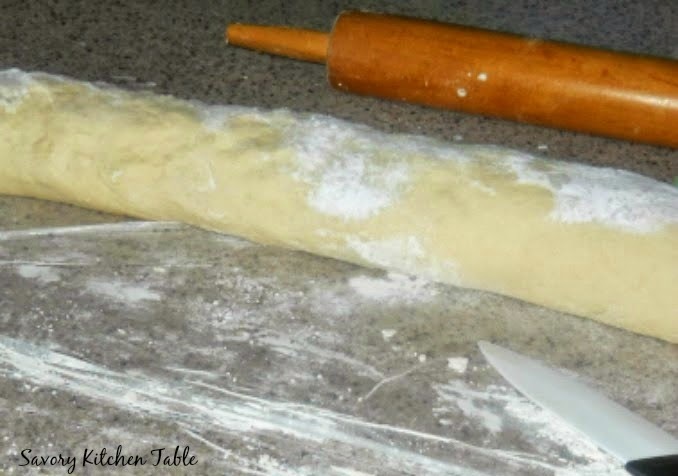 •Roll out the dough on a floured surface to a rectangle about 10 x 30 inches. I use Press-N-Seal to coat my counter - easy to roll out dough and easy to clean up that way. 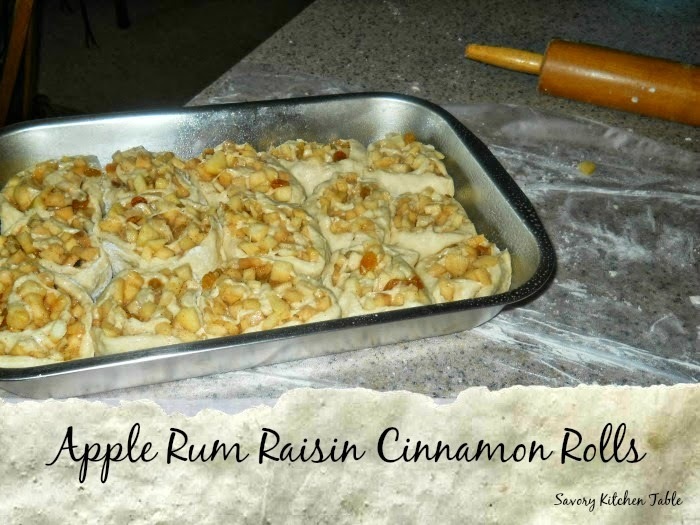 •Spoon the apple raisin mixture all over the dough and spread it out evenly. 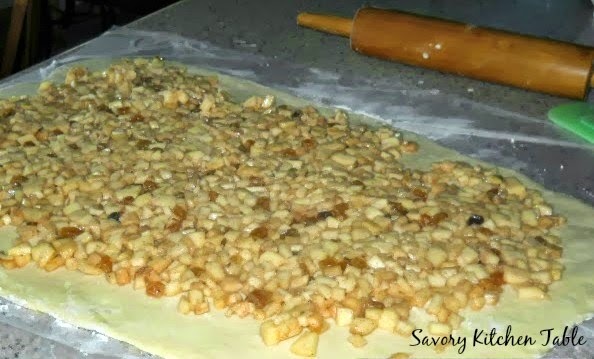 •Roll the dough toward you into a long, tight roll pinching the seam to seal the roll at the end. Roll it over so that the seam is on the bottom. •Slice each roll 1/2 inch to 3/4 inch thick placing them into prepped cake pans. •Set the rolls aside and let them rise for another 30 minutes. •Bake rolls for 15 to 18 minutes or until they're nice and golden. •Melt the butter and brown sugar in a saucepan over medium heat. •Add the brown sugar stirring to dissolve until it starts to bubble. •Add the cream, cooking for 2 minutes, whisking constantly. Remove from heat. •Whisk in 2 cups of powdered sugar until well blended. Add up to 2 more cups of powdered sugar to get to the consistency you want. Ice the rolls as soon as they come out of the oven. •Serve warm or cool completely to freeze. 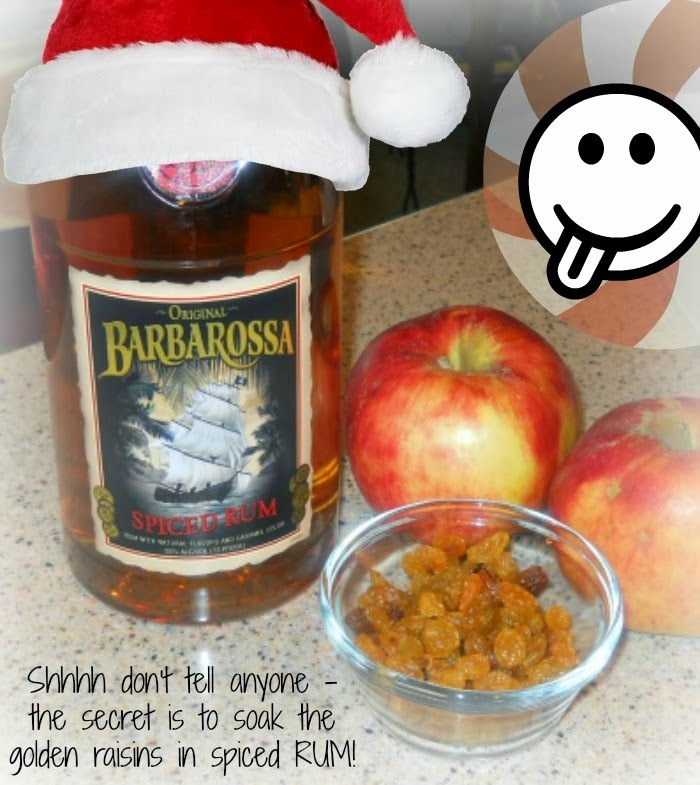 If freezing, wrap in several layers of saran, sealing all the edges well.